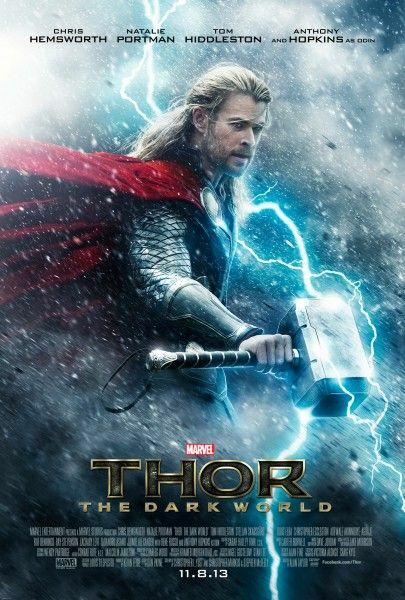 Marvel has unveiled the first poster for the sequel Thor: The Dark World. This debut comes ahead of the film’s first trailer, which is set to be released next week. There’s not much to the poster other than an intimidating-looking Chris Hemsworth as the titular character surrounded by a rather intense storm. The sequel, directed by Game of Thrones helmer Alan Taylor, will find Thor squaring off against the villainous dark elf Malekith the Accursed, played by Christopher Eccleston. Hit the jump to check out the poster, and come back on Tuesday, April 23rd to see the film’s trailer. The pic also stars Natalie Portman, Tom Hiddleston, Stellan Skarsgård, Idris Elba, Adewale Akinnuoye-Agbaje, Kat Dennings, Ray Stevenson, Zachary Levi, Tadanobu Asano, Jaimie Alexander, Rene Russo, and Anthony Hopkins. Thor: The Dark World opens in 3D on November 8th. Via Marvel. Click for high-resolution.